I am pleased to welcome you and to greet you all, to start with the President, Dr. John Lee, whom I thank for his words. Your qualification as "Catholic doctors" commits you to a permanent spiritual, moral and bioethical formation in order to implement the evangelical principles in medical practice, starting from the doctor-patient relationship up to the missionary activity to improve the conditions of health of populations in the suburbs of the world. Your work is a peculiar form of human solidarity and Christian witness; in fact, your work is enriched with the spirit of faith. And it is important that your associations commit themselves to sensitize medical students and young doctors to these principles, involving them in the associative activities. Catholic identity does not compromise your collaboration with those who, in a different religious perspective or without a specific creed, recognize the dignity and excellence of the human person as the criterion of their activity. The Church is for life, and her concern is that nothing is against life in the reality of a concrete existence, however weak or defenseless, even if not developed or not advanced. To be Catholic doctors, therefore, is to be health workers who from the faith and from communion with the Church receive the impulse to make their own Christian and professional formation more mature, their dedication untiring, the need to penetrate and know the laws of nature to better serve life (cf. Paul VI, Encyclical Letter Humanae Vitae, 24). The fidelity and coherence with which the Associations of your Federation, over the years, have kept faith in their Catholic physiognomy, implementing the teaching of the Church and the directives of its Magisterium in the medical-moral field are known. This criterion of recognition and action has fostered your collaboration in the mission of the Church in promoting and defending human life from its conception to its natural end, the quality of existence, respect for the weakest, the humanization of medicine and his full socialization. This fidelity has required and requires hardships and difficulties that, in particular circumstances, can demand much courage. Continue with serenity and determination on this path, accompanying the magisterial interventions in the areas of medicine with a corresponding awareness of their moral implications. The field of medicine and health, in fact, has not been spared from the advance of the technocratic cultural paradigm, from the adoration of human power without limits and from practical relativism, in which everything becomes irrelevant if it is not necessary for one's own interests (cf. Lit. enc. Laudato si ', 122). 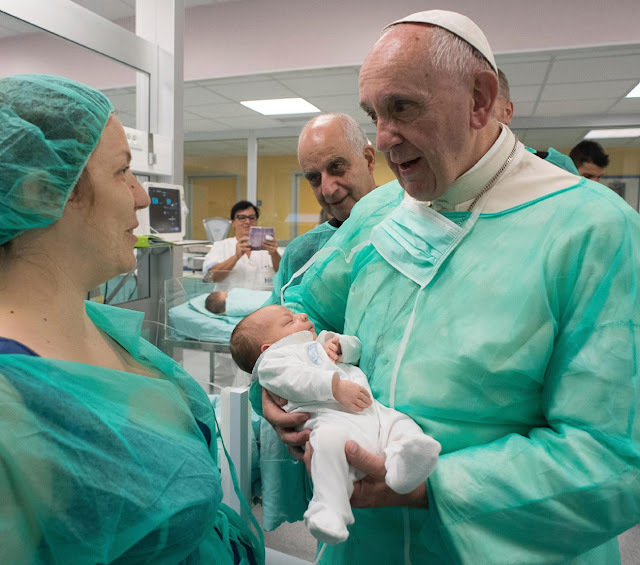 Faced with this situation, you are called to affirm the centrality of the patient as a person and his dignity with his inalienable rights, primarily the right to life. The tendency to debase the sick man as a machine to be repaired, without respect for moral principles, and to exploit the weakest by discarding what does not correspond to the ideology of efficiency and profit must be resisted. The defense of the personal dimension of the patient is essential for the humanization of medicine, in the sense also of "human ecology". It is your responsibility to work in the respective countries and at international level, intervening in specialized environments but also in discussions concerning legislation on sensitive ethical issues, such as termination of pregnancy, end-life and genetic medicine. Do not forget give help also in defense of freedom of conscience, of doctors and of all health workers. It is not acceptable for your role to be reduced to that of a simple executor of the will of the patient or the needs of the health system in which you work. In your next congress, which will be held in Zagreb in a few days, you will reflect on the theme "Holiness of life and medical profession, from Humanae vitae to Laudato si '". This too is a sign of your concrete participation in the life and mission of the Church. This participation - as underlined by the Second Vatican Council - is "so necessary that, without it, the apostolate of the Pastors can not for the most part reach its full effectiveness" (Decr. Apostolicam Actuositatem, 10). Be more and more aware that today it is necessary and urgent that the action of the Catholic physician presents itself with an unmistakable clarity on the level of personal and associative testimony. In this regard, it is desirable that the activities of the Associations of Catholic Doctors are interdisciplinary and also involve other ecclesial realities. In particular, know how to harmonize your efforts with those of priests, men and women religious and of all those who work in health pastoral care, putting them together with the people who suffer: they are in great need of your and their contribution. Be ministers, as well as care, fraternal charity, transmitting to those who approach, with the contribution of your knowledge, wealth of humanity and evangelical compassion. Dear brothers and sisters, many look to you and your work. Your words, your gestures, your advice, your choices have an echo that goes beyond the strictly professional field and becomes, if coherent, a testimony of lived faith. The profession thus rises to the dignity of a true apostolate. I encourage you to continue the associative journey with joy and generosity, in collaboration with all the people and institutions that share the love of life and endeavor to serve it in its dignity and sacredness. May the Virgin Mary, Salus infirmorum, support your intentions, which I accompany with my Blessing. And please, pray for me too. Thank you. John Paul ii, inspired by The Holy Spirit asked The Church over and over; to form a sustained 'sign' to the world for The Gospel of Life to be an integral concerted vast effort in all pastoral care and every effort of The Church. Yet, this has not been promulgated. We can only wonder as to why; but there are signs of the time. OF THE ENCYCLICAL, EVANGELIUM VITAE!